Choctaw Nation WIC has adopted the JPMA WICSmart platform to provide Nutrition Education for it’s WIC participants. Lessons are available to participants on tablet-based kiosks in the clinic as well as on-line from anywhere with an internet connection. Be pregnant, post partum, or breastfeeding and at nutritional risk. Birth to one year old and be at nutritional risk. Age one to five years old and be at nutritional risk. Meet the income eligibility guidelines. 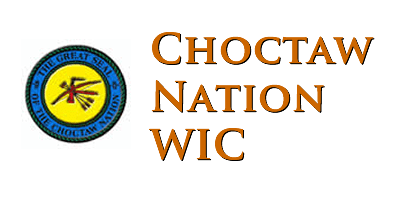 The WIC program is a nutrition program which provides foods that are high iniron, protein, calcium, vitamin A and vitamin C. The program is federally funded through the USDA and serves the 10 1/2 counties of the Choctaw Nation. WIC clinic sites are located at Hugo, Durant, Boswell, Antlers, Atoka, Idabel, Broken Bow, Talihina, Poteau, Wilburton, Stigler, Coalgate, McAlester, Bethel, Smithville and Spiro.